« Contest photo: Broadway, 2019. Why is this OK? There is a similar religious message on the other side. Could I do that, or is this a form of double standards, violation of separation of church and state, or is the CMA doubling down in the same way that it has cut back on secular concerts on Saturday nights in the Great Auditorium? This is not even a criticism per se, as it is a request for clarification. If you review the new Summer Program Guide, it is clear that the Camp Meeting Association is digging deeper and expanding into its religious mission. But what happens when that mission clashes with other views of how this town should be? Be sure you read that program guide. You will be impressed. on April 11, 2019 at 6:46 pm Confused "With You"
I was under the impression that we were a part of Neptune. They certainly govern, tax and decide what is best for us. If this is across a road that Neptune owns, how is this permissible in the context of separation of Church and State? I too would like clarification about what is going on and this a fine place to start. Blogfinger: Stop tiptoeing around this issue. The CMA has stepped over the line recently. They are more regressive than ever. They are holding sway over the town with their religious ideology. They are foisting their beliefs on others who cannot avoid their presence, especially in season. And they are moving in that direction as the town itself is changing with more secular citizens, more gay couples, and more residents (and visitors) who do not share the CMA’s vision for the town of Ocean Grove. The church vs state issue is real; it is the reason that the courts took governance away from the CMA in 1980, and now the CMA is heading backwards after a period of mutual balance–now they are blurring the lines of coexistence. This topic needs to be aired out, and this is a good place to start. The OGCMA owns all the land in OG, including the streets. The court ruling that caused the streets to be opened on Sunday ordered Neptune to maintain the streets. It did not give ownership of the streets to Neptune. Therefore the OGCMA has every right to hang what ever banner they choose to across Main Ave.
Kevin: If that is true, then they can do whatever they want anywhere in town, and no one else can do what they want without their permission. The OGCMA may do what ever they want with their non-leased property as long at it meets local and state codes and laws. The same for all private lease owners in OG. Codes and laws fall under local and state authority. If Neptune permits banners over roads within their zoning codes, then the OGCMA is permitted to hang one over Main Ave. Separate lease holders may also do what ever they want with their property as long as it is permitted by code and the laws of Neptune and the State. The OGCMA no longer may enforce local or state laws as they once did, that was ruled on by the court. If you want to put a banner over your front entrance and it is permitted by code and by law, then go ahead, you’re permitted just like the OGCMA. OGCMA owns the land. Homeowners lease it (another term for lengthy rent). Why–or better yet–what is the authorization for homeowners paying both taxes for the land and rent? What are the legal documentations ? Court order ? State statute? Bilateral agreement with township? OGCMA has had this phrase on the back of beach signs for years. One sees it when leaving the beach. It would be a shame if a truck with a cherry picker entered Ocean Grove and ripped this religious sign down. In OG, nobody owns the streets, they are a municipal “public right of way” reserved for motor vehicles, between the curb lines, and maintained by Neptune Township. Unlike most towns, the sidewalks and curbs are a pedestrian right of way owned by the CMA and maintained by the owner of the lot they front on. And if Neptune sends the tax bill to you, then you own the lot. Kevin tells us that the CMA is free to use its properties, which are all over town, even in the streets, however it pleases. However, those banners aside, there is another issue besides the legal. The town is full of religious messaging: programs (indoors and outside,) signs, ads, religious music and services every day on the boardwalk and at other venues, Sunday beach closings, cross on the beach, summer camps for kids, and presence of religious tourists on a daily basis in season. The point is that as the CMA messaging gets more pervasive, it influences the “meaning” of the town as perceived by others. The message is that Ocean Grove is largely a religious community, which it is not. Most of the CMA hub-bub in season is due to outsiders coming in. But that perception affects how the residents and how visitors and how media see the town. And many people use the words Ocean Grove as being synonymous with the CMA as documented in the writings, programs and ads of the CMA itself. On Blogfinger we have promoted the notion that Ocean Grove is a small residential historic town with a diverse, cultured, and largely secular resident population, and that the CMA is one faction among others. But now it seems that the CMA has other plans for the Grove’s future as it expands its religious focus in this small town. Will their actions cause the town to change as the CMA pushes back against a tide of secular input? And if it succeeds, what will happen to the demographics, business environment, lifestyles of residents, and the real estate market in town? Ocean Grove is a very open and welcoming town to ALL. 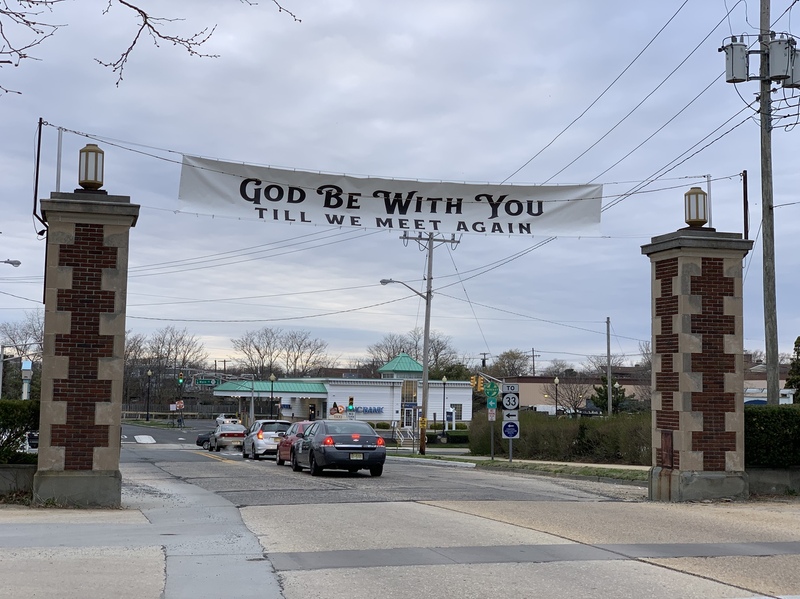 No one is forced to follow the religious beliefs of Ocean Grove as administered by the Camp Meeting Association – however why can’t those of us who moved here to worship our Lord not be allowed to do so? What “damage” does it do to the secular community to drive under that banner? Why can’t the Christian community and the secular community live in harmony? Why can’t we all follow the tenants of Jesus – to love one another and to not judge others? I actual thought the sign was reasonable given the 150 anniversary celebration this year. Hopefully it can be rehung in a safe way. The religious foundation is part of the identity, uniqueness and charm of Ocean Grove. It is something to be promoted and celebrated. Otherwise , we are just another shore town. I was not raised as a Methodist but I participate in the services offered at the auditorium – I enjoy them and feel part of the community. No one forces me to attend nor do I feel like anyone’s beliefs are being forced upon me. Would I like to see more collaboration between the Camp Meeting and the town in general- yes. But not valuing and appreciating the foundation upon which the town was founded, would be like throwing out the baby with the bath water. In this tumultuous world, it’s nice to get a blessing,; we don’t get enough! Ocean Grove is supposed to be a spiritual town..so I personally like it. The sign seems innocuous enough. However, is this starting a precedent? Perhaps OGCMA is pro-life and start sharing their anti-abortion views? And what “God” are they referring to? The Christian God the Father? Yahweh? Allah? Shiva? And what about Goddesses? May whatever God you believe in, bless you and the whole world, no exceptions. The term “separation of church and state” simply means (according to the founders of our country) that the State cannot force a religion on anybody. It does not mean that a religion, person or community cannot proclaim their religious beliefs in public. Tolerance is supposed to work both ways. But it was that doctrine that caused the CMA to lose governance over the town of Ocean Grove in 1980. It was a ruling by the State Supreme Court. As for the banner across Main Ave. that contained a religious saying , the reference to church vs. state was to say that in a town that is not a theocracy, wouldn’t it be best (neighborly) to not have large religious banners away from houses of worship, such as over the gates of the Grove, even if it is technically legal? How about putting such banners at the entrance (exit) of a house of worship. or for example at the entrance to the Camp Meeting. Of course, speech is a more malleable function, so someone could stand on a soap box and proclaim their religion. Surfer. You seem to be OK with religious banners as long as they embrace wording for all religions. But your idea would not satisfy those who don’t want any religious proclamations in prominent view such as the entrance and exit to our town. In fact, why should we have any featured religious speech around town? What is its purpose? Isn’t it enough to have freedom of religion in our country? Jean: I like it too. Freedom of religion is very important to me, but it is best to keep religion out of the public space. And yet some flexibility is required to allow the CMA to have their programs, to hear the church bells, to listen to gospel music on the boardwalk, to attend the choir festival, to witness the live nativity, etc. All that is wonderful, but too much can be risky in a town that preaches equality, justice, and tolerance. The CMA needs to see all of us who live here and consider the point of view of everyone in town. CMA has come along way from its past. No more committee interviews of potential home buyers–denying many. Then a similar form. Accepting help from a diverse community to rebuild after hurricane damage.. Diversity is greater than ever in Ocean Grove. Realistically it restored its appearance and its wealth. Blogfinger advocates respect for that diversity in CMA efforts to maintain its true religious meaning. What happened to the Banner? Was there Zoning approvable? Ocean Grove a “diverse” community ? Hardly . Not at all . OG is lilly white & quite affluent . Minorities & poor folks are virtually non existent in OG . This to me is more irksome then the hypocritical CMA mission . Just saying .